San Miguel de Allende has been a designated historical landmark since 1930. As such, the town has preserved its colonial heritage by banning new style construction, neon signs and other heralds of "modernization". The colonial buildings remain, today, in the same style as when they were originally constructed. The Jardin has been the center of the city since 1737. In the 16th and 17th century, this area was known as the "plaza parroquial", as the town gathered at the "plaza de la soledad", which is now known as the "Plaza Civica General Ignacio Allende". The "Jardin" was originally an paved, open area with a fountain in the center, much like the Zocalo of Mexico City, that has become the pattern of cities all over the country. In the 1860's, a garden was started and the fountain was replaced with a gazebo. The gazebo that is there today is a replacement built in 1950. The first building in the Jardin was the "Templo de San Rafael", also known as the "Santa Escuela de Cristo". Construction began in 1564 by order of the first bishop of Michoacan. The construction of the Parroquia de San Miguel Arcangel was started in 1689 with 1000 pesos. The building was completed in 1730, when the baroque-style towers were completed. In 1880, the neo-gothic tower of the Parroquia was added by command of the first Bishop of Leon, Father Diez de Sollano y Davalos, giving San Miguel's parish church its distinctive look that has made it an internationally recognized landmark. The master builder, Serefino Gutierrez based the design of the new construction from European postcards. The mansion immediately to the right of the Parroquia is the Casa de Allende. It is one of the best surviving examples of 18th century architecture of the Spanish colonial noblity. On the stonework decorating the balconies which face the Jardin, one finds such motifs such as grape clusters, flowers and other symbols of bounty. The Casa de Allende was constructed during the Golden Age of the colonial period. Ironically, it was the birthplace of the hero of Mexican independence from Spain, Ignacio de Allende y Unzaga. Born in 1769, Ignacio Allende joined the rebel forces that had gathered in nearby Dolores Hidalgo on September 19, 1810. He went on to fight a number of battles on behalf of the rebels, but was eventually captured and beheaded. 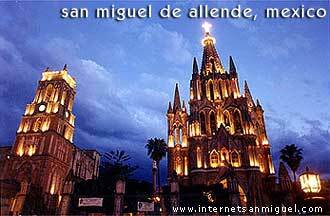 The town, formerly called San Miguel el Grande, changed to San Miguel de Allende in his honor. Walking between the Parroquia and Casa de Allende, on the street called Cuna de Allende (Allende's Cradle), we take a walk down one of San Miguel's typically narrow streets. This street was formerly known as Calle del Hospital, as it was home to a hospital, which was constructed in 1784. This building now houses one of San Miguel's many restaurants. At the end of this block we turn up the hill on the street called Cuadrante for just a few feet and enter the beginning of the street named Aldama. From here it is two blocks to Parque Juarez. This typical San Miguel street has been the subject of many painters' canvases, framing the old dome of the Parroquia so perfectly. To get to Parque Juarez, we follow Aldama until it intersects with Diezmo Viejo and Tenerias (the road where all San Miguel's tanneries were once located.) The park is modeled after the French style, and is planted with many native tree species, including walnut, mulberry and chirimoya. Many of the trees are over 100 years old, and provide a shady oasis from the summer heat. 22nd of March: We would like to welcome "ABC Realty" - our latest Real Estate Agency advertiser. 23rd of January: We would like to welcome "Real Estate San Miguel" - our latest Real Estate Agency advertiser.